(Manama) – Brent McMahon did more than qualify for the Ironman World Championships by winning Ironman Lake Placid. 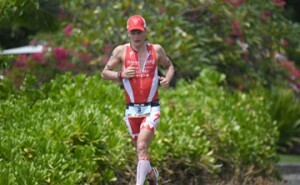 He also set new bike, run, and overall course records and handily won by nearly 24 minutes over the rest of the field. The former Olympian with the fastest Ironman debut on record and four sub-8 hour Ironman’s under his belt broke the Ironman Lake Placid tape in 8:14:04, breaking the previous mark of 8:33:11 set by mountain bike great Steve Larsen 13 years ago. Coming out of the 3.8-kilometer swim leg in just a little over 50 minutes, McMahon was within striking distance of the Top 3. Biding his time, he only made his move in the final 20 kilometers of the 180-kilometer cycle course to come into transition in the lead. It was here he set his first IMLP record, notching a 4:35:25 bike split. McMahon then took off on the marathon, setting a fastest-ever race record of 2:43:51. This is the Canadian’s third Ironman win and third course record including Ironman Arizona in 2014 and Ironman Brazil last year. Hoping he has set his early season woes behind him, McMahon will now focus on ensuring he peaks once again in Kona and performs to his talent and potential.